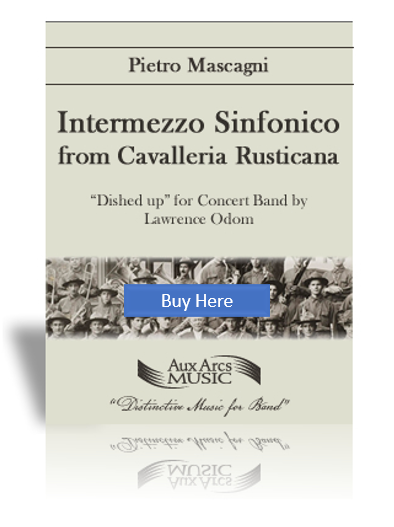 "Intermezzo Sinfonico" from Cavalleria Rusticana is a Grade 3 selection, well-suited to the mature junior high or high school band. Duration 3'45". Between the time Giuseppe Verdi wrote Otello and Falstaff, the Italian opera moved in reaction to the verismo school, based on “naturalism”, featuring stories with commonplace characters, settings and situations with which audiences could easily identify. Mascagni was only 27 years old when his most famous work, the Opera Cavalleria Rusticana (Rustic Chivalry) opened with brilliant success, giving birth to verismo. This one work launched Mascagni into the international opera circuit, but despite a long career, he was never able to duplicate its success. His most popular surviving musical fragment is the “Intermezzo”, having been used in the soundtrack of several films, including Martin Scorsese’s Raging Bull, The Godfather, Part III and the HBO series The Sopranos. The orchestral “Intermezzo” occurs between the two scenes of the opera’s single act, and evokes the Easter day religious spirit of the opera’s setting. Mr. Odom recommends 4 flute players, 4 players each on the non-solo Bb Clarinet parts, 3 players on the tuba part, 2 cellists and 3 string bass. The cello parts are optional, but effective when used.